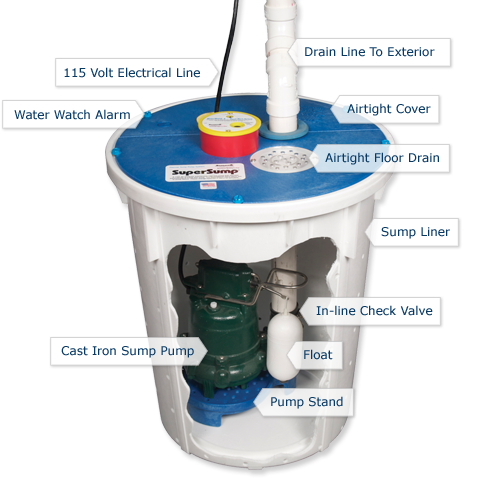 Check Up On Your Sump Pump & Basement Waterproofing System | News and Events for Basement Systems, Inc. Your basement waterproofing system, complete with a high-volume sump pump, drainage pipe, dehumidifier, or any other products, works hard every year to keep your basement dry. It gives you the peace of mind you deserve, knowing that a water emergency won't suddenly arise. However, if you don't take good care of your sump pump now, it might fail you in the future. That's why Basement Systems strongly recommends performing annual maintenance on all parts of your waterproofing system. Not only will maintenance help improve the lifespan and function of your waterproofing system, but we will also be able to detect any potential issues early - before they lead to a basement flood! Your technician will determine if your sump pump's float switch, intake, check valve and impeller are all working correctly. Getting rid of sediment and silt in the sump liner will help ensure your system continues to function properly. Your WaterWatch Alarm batteries need to be switched out every year, and annual maintenance is a perfect time for this to get done! Making sure your discharge line is clear and that it won't freeze will keep your whole system working year-round. If your basement has a dehumidifying system, your service technician will see if the filter needs to be replaced or if the unit needs to be oiled. Your Basement Systems dealer will also inform you of any additional issues as they perform each of these steps, suggesting further work or possible upgrades if necessary. If you're concerned about the state of your sump pump - or if it's been a while since you've had anyone out to look at it - schedule an appointment today! Basement Systems dealers are available across the country to help serve you.